As medical director, I wanted to alert the Newtown Vet family to a new toxicity that is on the rise in dogs and cats due to the increased availability of sago palm plants from some large retailers. Much of the below information was delivered to us courtesy of Dr. Catherine Dzienesiwski from Veterinary Specialty and Emergency Center. 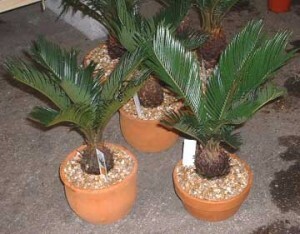 The sago palm plant is a highly poisonous plant commonly found in sandy soils of tropical to subtropical climates, but may also be grown as ornamental and houseplants. This plant is not usually a concern for pets in our area since they are not native to our region. Recently, we have become aware of local stores including Wegmans, Walmart, Home Depot, and IKEA selling these plants in miniature form. Unlike the areca palm, and majesty palm, sago palms are not true palms, rather they are members of the Family Cycadaceae (Cycas spp., Macrozamia spp.). All parts of the plant are toxic, but the seeds (nuts) are the most toxic, containing a higher concentration of the toxin cycasin. Initial signs of toxicity following ingestion may be seen in at little as 15 minutes including in acute gastrointestinal distress (e.g., drooling, inappetance, vomiting, diarrhea), central nervous system (brain) signs (e.g., weakness, walking wobbly, seizures, tremors, etc.) and severe liver failure can be seen within 2-3 days after ingestion. Aside from the aforementioned symptoms, other delayed signs of illness may include swelling of the abdomen (belly), bruising, and jaundice (yellow color to skin). Induction of emesis (vomiting) is generally recommended if the pet has recently ingested the plant. As with most toxicity, there is at most a two hour window of opportunity for vomiting to be induced. After this time frame, digestion and absorption of the toxin is likely to have occurred such that vomiting is no longer beneficial. All patients will likely need to be hospitalized. Some studies have shown mortality rates to be as high as 30 to 50%. We recommend that if you have pets, you should keep sago palms out of your home. As always, if you have any questions or concerns, please do not hesitate to contact us. 1. Albertson, Khan, and Richardson. Cycad palm toxicosis in dogs: 60 cases (1987-1997), Journal Am Vet Med Assoc 1998; 213(1): 99-101. 3. Ferguson, Crowe, McLaughlin, Gaschen. Survival and Prognostic Indicators for cycad intoxication in dogs. Journal Vet Int Medicine2011;25(4):831-7.